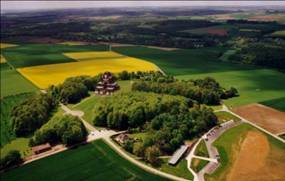 A HISTORY OF THE BUILDING OF THE THIEPVAL VISITOR CENTRE WHICH WAS OPENED IN SEPTEMBER 2004. This was a joint venture between British and French partners and on completion responsibility for the whole Centre was assumed by the French partner. British interest is maintained through the "Comité franco-britannique" which meets annually. The British Embassy in Paris, the Commonwealth War Graves Commission, the Lutyens Trust, the Charles Skey Charitable Trust, the Imperial War Museums and the Royal British Legion are members of this committee. The Secretary (2014) is M. Alain Petitjean who is the Joint Chief Executive of the Conseil Général of the Somme. This website, which is no longer up-dated, was the original Thiepval Project British fundraising website. A Stop Press element on this website was maintained on the basis of information supplied by Sir Frank Sanderson. He retired in September 2014 and this website now remains for historical and research purposes . The Manager of the Centre (2014) is M. Vincent Laude. 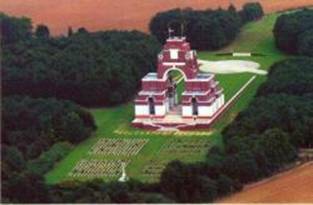 Thiepval is the largest and one of the most emotive memorials to the Missing from any war in which British soldiers have died. It stands in an isolated windswept position on the Somme - and had absolutely no facilities for visitors and nothing to explain what had happened there in 1916. All that visitors found were 600 British and French graves and the names of over 72,000 British soldiers carved into the stone of the massive memorial, designed by Sir Edwin Lutyens and beautifully maintained by the Commonwealth War Graves Commission. Tragically, many of us have a direct family connection with at least one of these names. That is why we return; and that is why many thousands of school children are taken there each year. In 1999, under the patronage of His Royal Highness The Duke of Kent and Sir Michael Jay, the then British Ambassador to France, a small group of people came together to rectify this sad situation. This group consisted of Sir Frank Sanderson, Colonel Piers Storie-Pugh, then of the Royal British Legion, Madame Geneviève Potié MBE (the Mayor of Thiepval), Brigadier Andrew Gadsby (then Military Attaché at the British Embassy in Paris) and Sénateur Fernand Demilly, then Président of the Conseil Général of the Département of the Somme. After searching for a way forward it was soon realised by the British members of the group that the only solution was for them to seek to raise funds in the UK and then discuss the matter with the Département of the Somme. Sénateur Demilly then generously agreed not only to match funds raised in the UK, but also to organise the construction and then to run the visitor centre. This arrangement was welcomed by the British Government and UK fundraising went ahead. The Centre was opened by His Royal Highness on 27th September 2004 and is now the property of and run by the Conseil Général de la Somme. Since 2004 the Conseil Général has spent considerable funds expanding the car park and installing air conditioning. The Thiepval Project provided a mechanism to ring the church bell, provided extra UV protection on the windows and replaced some of the exhibition panels which had faded in the sun. In early 2014 with funds from the Charles Skey Charitable Trust a new edition of the exhibition guidebook was produced.